Today’s card of the day are two Darkness support cards. 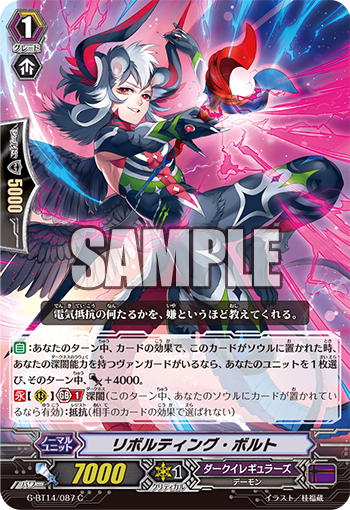 AUTO During your turn, if this card was put into your soul by a card effect, if you have a vanguard with the Darkness ability, choose one of your units, and it gets Power+4000 until the end of the turn. 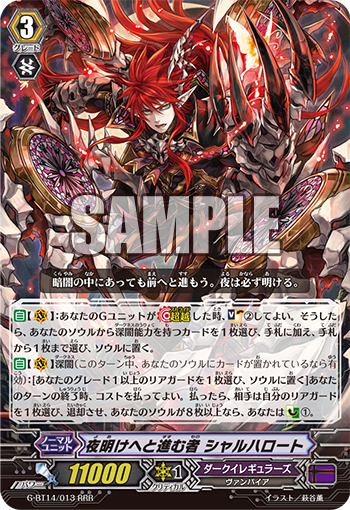 ACT (RC) Generation Break 1 Darkness [Counter Blast 1, put this unit into your soul, choose one of your other rear-guards, and retire it] Choose up to two grade 1 or greater units with the Darkness ability from your soul, and add them to your hand.